Cypress Point Golf Club and Monterey Peninsula pictures. Please Note: *If you are an AOL User Caddybytes Golf Course Picture Tours are best viewed Outside of AOL's browser -best to use a separate Internet Explorer, Mozilla, Netscape, or the browser of your choosing (other than AOL's)! Welcome to Our Caddy Bytes exclusive pictures of Alister MacKenzies Famous Cypress Point Golf Club Links, on the Monterey Peninsula! The tour is of the last four holes of the Cypress Pt. Golf Club which are the most visually dramatic. Alister MacKenzie was the golf course architect who designed the Cypress Pt. Golf Club. MacKenzie is known for taking spectacular landscapes and leaving the natural beauty alone as much as possible. He did this with the Berckmans 365 acre property known as Fruitlands Nursery and arboretum, which is now the Augusta National Golf Club, as well as with many of his other designs. This golf course design style along with the early preservation of the Monterey Peninsula by S.B Morse, allows us today, to go back in time and see pretty much undisturbed, the natural beauty that this beautiful tract of land still affords. The ocean views are spectacular, with the golf course set in amongst an ancient Cypress Tree Forest. Even today, with the ocean mist filling the air, the sea lions barking from the rocks - you can stand on these final four holes taking in all this natural backdrop that is the Cypress Point Golf Club, and just imagine how it all might have looked a hundred or more years ago. Enter Here to pictures of the Cypress Point Golf Club! Click the hole sign or here! 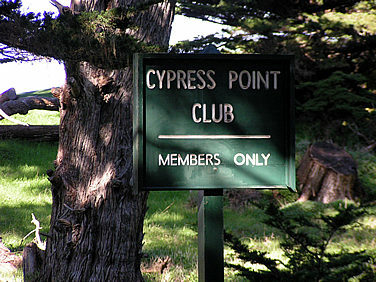 Click Here to next pic'x of Cypress Point G.C..